Arthur Conan Doyle and Fulton Oursler. 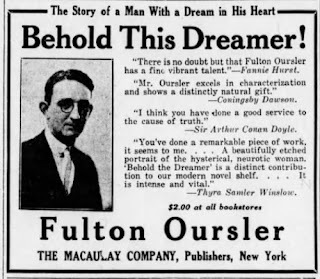 This Forbes article on "Imponderable"—a new exhibition of work by artist Tony Oursler at LUMA Westbau (Zurich)—notes one source: a debate on spiritualism between Oursler's grandfather, Charles Fulton Oursler (Reader's Digest editor, author of The Greatest Story Ever Told, and mystery writer Anthony Abbot, 1893–1952), and fellow writer Arthur Conan Doyle. Complications ensue when a criminal's brain is transplanted into a professor. Boris Karloff and Bela Lugosi star, and Curt Siodmak (brother of The Spiral Staircase's Robert Siodmak) is one of the screenwriters. NMU commemorates Anatomy of a Murder. Via various items posted online, the Northern Michigan University archives are commemorating Anatomy of a Murder by attorney, writer, fisherman, and Michigan Supreme Court justice John D. Voelker (1903–91). Voelker successfully defended Army lieutenant Coleman Peterson, who was accused of killing tavern owner Mike Chenoweth in 1952. Voelker then turned the case into fiction; the book was published by St. Martin's Press in January 1958 under Voelker's pseudonym, Robert Traver. It became a well-regarded film in 1959 with Jimmy Stewart, Lee Remick, Ben Gazzara, and George C. Scott. In 2013 ABA Journal selected Anatomy of a Murder as one of 25 greatest law novels. The Cat and the Canary (1939). In The Cat and the Canary, Paulette Goddard will inherit a sizable fortune if she does not go mad within a month, and relatives are intent on helping that along. Bob Hope and Gale Sondergaard also star. Based on a play by John Willard, it previously was adapted as a 1927 silent film and subsequently as a 1978 film with Honor Blackman, Edward Fox, and Wendy Hiller. Ernest A. Young, detective dime novelist. Brandeis Special Collections highlights its newly acquired papers of Massachusetts resident Ernest A. Young (1858–1936), who was known for his detective dime novels under pseudonyms such as Harry Rockwood. His works include Harry Pinkurten, the King of Detectives (1882) and Clarice Dyke, the Female Detective (1883). 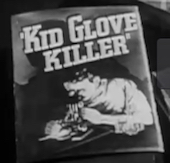 In Kid Glove Killer, police lab chief Van Heflin analyzes crime scene evidence from the murder of the city mayor, abetted by a lively Marsha Hunt. Fred Zinnemann (High Noon, From Here to Eternity) directed the film. The return of pioneering PI Race Williams. 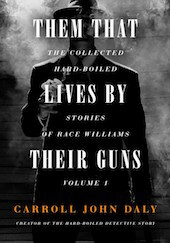 Altus Press has issued Them That Lives by Their Guns: The Collected Hard-Boiled Stories of Race Williams, vol. 1, with an introduction by Clues contributor Brooks Hefner. The creator of Williams, Carroll John Daly, launched the hard-boiled style with such stories as "The False Burton Combs" (1922) and "It's All in the Game" (1923). "Burton Combs" predates Dashiell Hammett's first story for Black Mask by several months. Perhaps this collection of 16 stories can help refute the jaw-dropping assertion in the BBC Radio 4 program A Coat, a Hat, and a Gun (hosted by Harriett Gilbert, daughter of British mystery author Michael Gilbert) that the hard-boiled "genre was really invented by ... Hemingway with a short story in 1928 called 'The Killers.'" 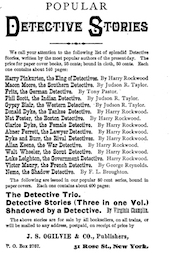 In fact, "The Killers" is a March 1927 Scribner's magazine short story, which appeared several years after Daly's groundbreaking work. Ten Years of The Bunburyist. Elizabeth Foxwell in an investigative mode. It's hard to believe that 10 years ago today, I clicked the "Publish" button, and this blog began. 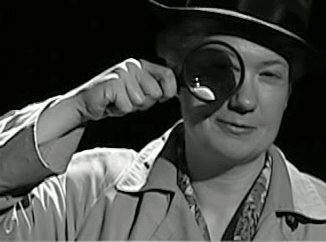 I thought a blog could provide visitors with a way to learn about the contents of Clues: A Journal of Detection; read about neglected mystery works; and find links to interesting aspects involving the history of mystery, detective, and crime fiction—especially vintage audio and video. Although I tend not to receive a lot of comments, people seem to like what they see. Statistics indicate that the blog receives more than 5000 hits a month and has 59 loyal followers. Sadly I have needed to reduce the number of posts per month because of my publishing and job commitments, as well as the work entailed for my new blog on American women in World War I. The following are the top 10 posts of The Bunburyist based on views. Do you have other favorites? 10. "Fri Forgotten Books: Charlotte Armstrong's The Chocolate Cobweb (1948)"
9. "Clues 31.2: Collins, Harvey, Highsmith, Parker, South African and Spanish crime fiction"
8. "Cornerstone: The Horizontal Man, by Helen Eustis"
7. "Fri Forgotten Books: The Mystery of Central Park, by Nellie Bly (1889)." After I posted about this rare book and mentioned it on a women's studies listserve, the Library of Congress digitized its copy and made it available via the Internet Archive. 5. "Dr. Barbara Mertz, Trailblazer"
4. "The Dude Abides: The Big Lebowski and The Big Sleep"
3. "Cornerstone: Re-Enter Sir John (1932)"
2. "'The Grave Grass Quivers,' by MacKinlay Kantor (1931)"
1. "Dozen Best Detective Stories Ever Written"
The Senator Was Indiscreet (1947). A film for Election Day: The Senator Was Indiscreet, in which politician William Powell eyes the presidency, promises health legislation guaranteeing that everyone will have a normal temperature, and causes consternation for his party when his imprudent diary goes missing. The film was directed by George S. Kaufman (The Man Who Came to Dinner), with The Front Page's Charles MacArthur as screenwriter. Europe's public libraries and refugees. 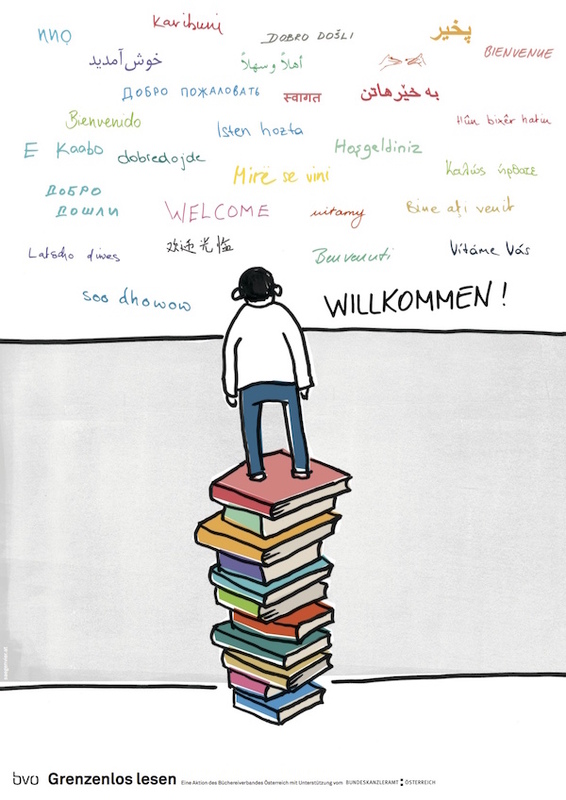 The Public Libraries Section of the International Federation of Library Associations and Institutions presents a roundup of ways in which public libraries in Europe are reaching out to refugees. For example, the Cologne Public Library has an intercultural library forum that offers, among other services, readings in multiple languages for refugee children. The Cologne Public Library also has the "Krimiautomat" in the metro system, where commuting library patrons can borrow crime fiction titles.